Jesus proclaims Peter very fortunate for his rightful faith declaration: Peter answered, ‘You are the Messiah, the Son of the living God’. Jesus replied ‘It is well for you, Simon Barjona, for it is not flesh or blood that has revealed this to you but my Father in heaven’ (Mt 16:16-17). By this congratulation Jesus promises Peter the primacy of his Church; but, shortly after, He scolds Peter for having a very human and wrong idea of what the Messiah would do: Then Peter took him aside and began to reproach him, ‘Never, Lord! No, this must never happen to you’. But Jesus turned to him and said, “Get behind me, Satan! 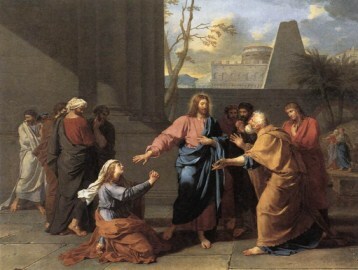 You are a stumbling block to me; you do not have in mind the concerns of God, but merely human concerns.” (Mt 16:22-23). We have to be grateful to the evangelists for presenting us the first disciples of Jesus as they actually were: no idealized characters, but people of flesh and blood as ourselves, with their defects and virtues; which gets them closer to us and helps us to see that perfecting ourselves in Christian life is a certain path we all have to follow, for nobody is born knowing all the answers. As we already know how history goes, let us accept Jesus Christ was the suffering Messiah prophet Isaiah announced who offered his life in the Cross. What is more difficult to accept is that we must keep on presenting his work by following the same path of surrendering, renunciation and sacrifice. Imbued, as we appear to be, with a society that encourages quick success, learning without any effort and in a funny way, and achieving the maximum profit with the least possible strain, it should not surprise us we end up by seeing things more as people do than as God does. Once he received the Holy Spirit, Peter learned where the path he had to follow went through and he lived by this expectation. “World tribulations are full of sadness and empty of any prizes; but those we suffer for God are softened by the hope of an eternal prize” – St. Ephraem. Jesus withdrew to the region of Tyre and Sidon. Now a Canaanite woman came from those borders and began to cry out, “Lord, Son of David, have pity on me! My daughter is tormented by a demon”. But Jesus did not answer her, not even a word. So his disciples approached him and said, “Send her away: see how she is shouting after us”. Then Jesus said to her, “I was sent only to the lost sheep of the nation of Israel”. But the woman was already kneeling before Jesus and said, “Sir, help me!”. Jesus answered, “It is not right to take the bread from the children and throw it to the little dogs”. The woman replied, “It is true, sir, but even the little dogs eat the crumbs which fall from their master’s table”. Then Jesus said, “Woman, how great is your faith! Let it be as you wish”. And her daughter was healed at that moment. Today, we often hear the expression “faith has been lost”, and the same people who ask our communities the baptism of their children or the catechesis for their infants or the sacrament of marriage, say it. These words depict the world in a negative way while trying to convince us bygone times were better and that we are now at the end of a stage where there is nothing left for us to say or to do. Evidently, these are basically young people who, in its majority, watch rather sadly how the world has changed from their parents’ times, who used to live perhaps a more popular faith, which they have not known how to adapt to. This experience leaves them unsatisfied and without any capacity of reaction when, in fact, they might find themselves at the gates of a new stage they could very well take advantage of. This passage of the Gospel draws the attention to that Canaanite mother that demands grace for her daughter by recognizing in Jesus the Son of David: “Lord, Son of David, have pity on me! My daughter is tormented by a demon” (Mt 15:22). The Master is surprised: “Woman, how great is your faith!” and He can do nothing but to act in favour of those persons: “Let it be as you wish” (Mt 15:28), although this does not seem to fall within his schedule. However, God’s grace is manifested in human realities. Faith is not a privilege of a few, nor is it the property of those who think they are so good or of those who have ever been good, and have this social or ecclesial label. God’s action precedes any Church’s action and the Holy Spirit is already acting upon persons we would have never suspected could bring us a message from God, a request in favour of the needy. St. Leo says: “My beloved, the virtue and wisdom of Christian faith are our love of God and of our neighbour: it does not miss any obligation to any pious works procuring to render God worship due to him and to help our brethren”. After the crowds have eaten their fill, Jesus obliged his disciples to get into the boat and go ahead of him to the other side, while He sent the crowd away. And having sent the people away, He went up the mountain by himself to pray. At nightfall, He was there alone. Meanwhile, the boat was very far from land, dangerously rocked by the waves for the wind was against it. At daybreak, Jesus came to them walking on the lake. When they saw him walking on the sea, they were terrified, thinking that it was a ghost. And they cried out in fear. But at once Jesus said to them, “Courage! Don’t be afraid. It’s me!”. Peter answered, “Lord, if it is you, command me to come to you walking on the water”. Jesus said to him, “Come”. And Peter got out of the boat, walking on the water to go to Jesus. But, in face of the strong wind, he was afraid and began to sink. So he cried out, “Lord, save me!”. Jesus immediately stretched out his hand and took hold of him, saying, “Man of little faith, why did you doubt?”. As they got into the boat, the wind dropped. Then those in the boat bowed down before Jesus saying, “Truly, you are the Son of God!”. Now we shall not look at Jesus sleeping on the boat while it sinks, nor rebuking the winds and the waves with a single word, so his disciples may be amazed (Mt 8:23-27). But, today’s action is no less disconcerting, whether for his first disciples or for us. Jesus had obliged his disciples to get into the boat and go ahead of him to the other side; and after the crowds have eaten their fill, He had sent the crowd away. And, then, He went up the mountain by himself to pray. And He remained there alone. (Mt 14:22-23). Without his Master, the disciples were having troubles to face the wind. It was then when Jesus came to them walking on the water. As plain and simple people would, the disciples were terrified to see him: men do not usually walk over water, so they thought they were seeing a ghost. But they were wrong: it was not an illusion what they were looking at, but the very Lord, who was inviting them – as He did quite often – not to be afraid and trust him to awake their faith in them. This faith was first demanded to Peter, who said: “Lord, if it is you, command me to come to you walking on the water” (Mt 14:28). With these words, Peter showed that faith consists of abiding by the word of Christ: he did not say “let me walk on the water” but he just wanted to follow what the very and only Lord could command him to do, to believe the truthfulness of the Master’s words. His doubts, however, made him reel, but they led the other disciples to bow down and confess before their Master: “Truly, you are the Son of God!” (Mt 14:33). The group of those that already were apostles, but did not yet fully believe, when they saw the waters waving below the Lord’s feet and appreciated his steps were firm through the stormy waves (…) they believed Jesus was the true Son of God, and accepted him as such. – St. Ambrose.